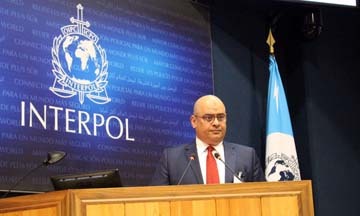 (Lyon) – Chief of Public Security, Major-General Tariq Al Hassan has led Bahrain’s delegation in the second meeting of Police Chiefs in the Middle East and North Africa (MENA) region at the headquarters of the International Criminal Police Organization – INTERPOL, in Lyon, France. The Chief delivered a speech, in which he conveyed the greetings and best wishes of Interior Minister, Lt-General Shaikh Rashid bin Abdullah Al Khalifa to reach outcomes and recommendations that meet the level of unprecedented security challenges in the region and reinforce security cooperation to serve the best interests of Arab security. The Chief welcomed the Palestinian delegation that participants for the first time after the approval of the membership of Palestine. He said that the meeting comes with many security changes and threats as result of contemporary and cross-border crimes, in which they risk the security of nations and the values of humanity. He said that changes and threats imposed the need for further regional and international cooperation in fighting crimes and chasing criminals to eliminate any location that could shelter fugitives. Al Hassan said that the most serious threat is the increase in terrorism and extremism with their risks on the whole world. He said that the risks have become global because of the financial and logistic support of some countries and groups to those criminal gangs that practice and promote terrorism under misleading names. He said that Bahrain has suffered from organised terrorist attacks by terrorist groups that are trained, financed and armed by parties that seek terrorism to achieve their goals to destabilise the region. “With simple analysis of these terrorist attacks, we can find remarkable development in terms of targets, nature, materials in use, planning and execution,” Al Hassan said, adding that investigation that involved the arrestees and collected evidence indicated that the members of the terror cells were trained and supported by specific foreign parties. He said that the security authorities succeeded in dismantling and thwarting their plans. He said that the region suffers other criminal threats that their risks aren’t less than the threats of terror crimes and extremism, such as the organised crimes and weapon, explosive, drug and human trafficking, in addition to cybercrime. They all risk the security and stability of nations, highlighting the exploitation of social media by terror organisations, extremists and sexual abuse of children to spread hated and extremism because of the absence or lack of ability of law enforcing organisations to keep pace with this rapid development. 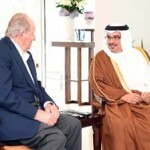 Al Hassan said that despite criminal and terrorist threats, the Kingdom of Bahrain has a unique experience in the protection of security and fighting crimes. He highlighted the achievement could be attributed to support of the wise leadership, the awareness of citizens and residents and the participation of all members in society in achieving the comprehensive concept of security, along with the sacrifices of police personnel to protect the security and stability of the community. He said that the sacrifices of Bahrain police come in a form of 22 deaths and 3500 injuries, including more than 90 with permanent disability in the last six years. He said that the Interior Ministry has adopted a crime-fighting strategy that has three dimensions; crime prevention, scientific and technological methods in tackling crimes and preventative and rehabilitation programmes. Al Hassan said that the Kingdom has given top priority to international cooperation through exchange of information, expertise and joint work in fighting crimes and security threats. The crime-fighting capabilities had been improved through the creation of a database of important information to detect crimes. The Interior Ministry has the potential and expertise to face all criminal threats and security crisis. He said that criminal threats in the world and the region need to be tackled by further cooperation and coordination, valuing the efforts of the INTERPOL as a strategic partner in achieving security and fighting crimes. He highlighted the support of the Kingdom of Bahrain for the establishment of a regional office for MENA to back police work and security. The meeting discussed various topics, including latest INTERPOL programmes and revision of cooperation efforts. Al Hassan held a meeting with the INTERPOL Secretary General, Jürgen Stock, in the presence of Head of the Coordination MENA Office of the INTERPOL, Abdulaziz Abeedallah. The meeting discussed cooperation between Bahrain and the organisation and topics of common interest, including how the Interior Ministry could benefit from the services provided by the INTERPOL Global Complex for Innovation (IGCI) in Singapore.